spas and decorative pond sanitising. Thousands of people worldwide have chosen to convert their pools from chlorine and salt to EnviroSwim Fresh Water Technology. WHY is this system now the preferred option today? Chemically Free Oxidisers are produced direct from the water itself and delivered into the water stream in grams per minute via "Electronic Oxidation" complete with copper and silver Ionisation. Ultrasonics used in the Enviro Swim system further helps to improve the water quality by removing existing scale and preventing the formation of scale caused by silica in the water. This process improves the efficiency and reduces the operating costs of the pool filtration / circulation and heating equipment. The EnviroSwim provides the latest and efficient TOXIC FREE purification technology available today for not only Swimming Pool water and Swim Spas, but also for decorative water features ponds and waterfalls. Commercial applications that require healthy water such as chicken growers and hatcheries should consider this method as a healthier alternative to chlorine treatment of the water used in their process. 100% Chlorine, Salt, Bromine, Bacteria and Algae FREE TECHNOLOGY!
. Is your pool water practically salt Free?
. Is your pool water 100% Chlorine Free?
. Is your pool water Chemically ... Toxin Free?
. Is your pool water Free of Carcinogenic Trihalomethane Gas?
. Is your pool water 100% Free of Algae and Bacteria?
. Can you Irrigate your plants and garden with your pool water?
. Can your animals drink your pool water without damage to their health?
. Is your pool water Corrosion - Odour - and Stain Free?
. dry hair - and irritating skin reactions?
. And what about people with Asthma or skin Allergies? Is your pool water so clean - Pure and Healthy its ..."Fit to Drink"? IF NOT - IT SHOULD BE! 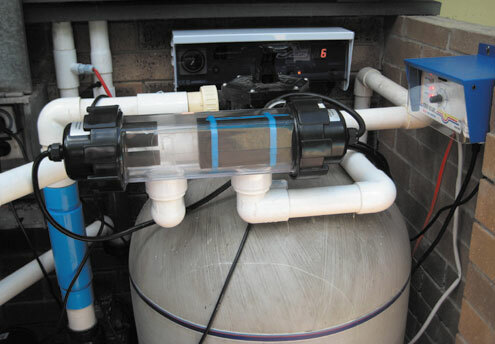 The ES3 EnviroSwim Freshwater Pool Management system treats residential pools with volumes up to 100,000 litres. It will provide you with a freshwater swimming experience you'll greatly appreciate. The latest design and technology provides you with pristine clear water all year round in all climatic conditions. 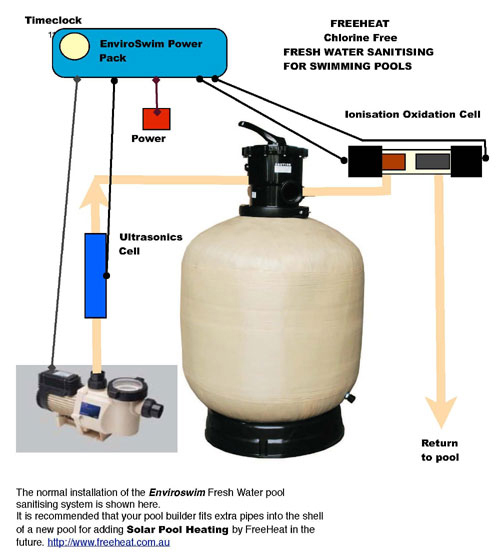 Follow these instructions as an EnviroSwim System pool differs from common chlorine/salt pools. · Do not use Granular Chlorine. The use of Granular Chlorine may cause black staining of the pool rendering if it is added undiluted to a pool treated by an EnviroSwim System. · Do not throw un-dissolved chemicals into the pool. · Clean the pool filter regularly. Due to the many different test kits on the market, we recommend that you follow the manufacturers instructions supplied with each EnviroSwim test kit. Refer to the manufacturers detailed installation manual supplied with the unit. If you retrofit a chlorine pool, the chlorine will have evaporated in a couple of days so you don't need to refill your pool. If retrofitting a saltwater chlorinated pool, there is no need to change over the water either. Usually there is some level of solids leftover from the salt chlorination process, but the system is designed to cope with that. Add calcium to your pool until the hardness has reached 250 ppm. The best is to use calcium chloride flakes or pellets. Your local chemical wholesaler will stock this. The initial dose will be about 25 kg on a 100,000 ltr pool. A detailed installation, water balance and operating manual is provided with each EnviroSwim unit. Please contact Free Heat with any questions relating to your EnviroSwim Freshwater Swimming Pool system. Pool shops supplying non-EnviroSwim systems do not, have the experience to advise you correctly. For ideal operation EnviroSwim requires a TDS level of between 800-1200 ppm to provide conductivity for its electronic processes. When converting Salt Water Pools or pools where TDS exceeds 2000ppm please contact Free Heat. If TDS is low, adding 5kg of pool salt per 10,000 litres of water will raise the TDS by around 500ppm. For new pools, or those that have just been refilled, add pool salt to ensure the conductivity of the water is high enough for the ionization process to take over. If retrofitting to an existing pool the conductivity of the water should be sufficient for the EnviroSwim system process to initiate. When the system is initially installed, it will need to be run continuously for a time to allow the various processes to take effect in the pool. 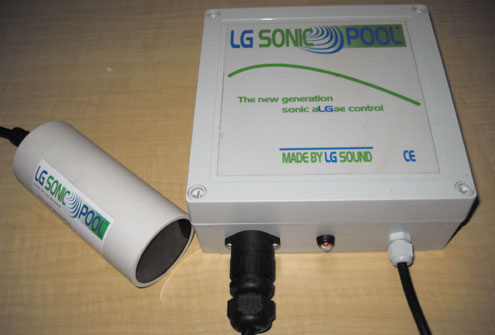 The time taken to initialize the system will vary, depending upon the volume and conductivity of the pool water. Typically a 50,000 liter pool would take 48- 60 hours to build up the copper level to the required 0.25 ppm. 1. Turn on the pool pump so that water is flowing through the filtration system and the EnviroSwim ionization/oxidation chamber and ultrasonic emitter pipe. 2. Make sure that the ionization/oxidation chamber is filled with water. 3. 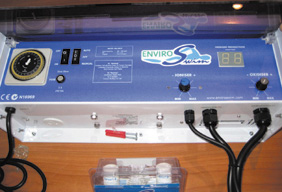 Turn both controls (Ioniser and ORP) on the EnviroSwim control box fully counter-clockwise. 4. Turn on the green power switch on the control box and make sure that the light in the switch is illuminated. 5. The LEDs on the control box should be illuminated as follows from left to right; the first LED will alternate from red to green approximately every six minutes, second LED will change colour every 3-5 seconds. Turn the knob on the control box under the ioniser meter slowly clockwise to its maximum position. This setting provides maximum copper/silver ion production providing that the conductivity of the water is high enough. 6. Turn the knob on the control box under the ORP meter slowly clockwise until the ORP meter reads between 13 - 15 Amps. If the maximum output is below 12 amps the conductivity of the water may be too low. 7. Allow the unit to run for 48 hours. 8. Perform chemical tests to determine readings for pH, ORP, alkalinity, copper, and calcium hardness. Reduce the run time on the unit to 1 hour per day for every 10,000 litres of water in the pool and turn the knob on the control box under the ioniser meter slowly counter-clockwise until the ioniser output is mid setting (50% output) The system is now operating normally and the initial start-up phase is completed. The copper output could later be adjusted as necessary to find a setting that will maintain the 0.2 – 0.4 ppm recommended level. Phosphates- test for monthly - please contact your dealer if phosphate is present. Backwash the filter monthly or sooner –or if the pressure gauge on filter indicates the need. See Backwash instructions. Pool shops supplying Non -EnviroSwim systems do not have the experience to advise you correctly. pool treatment system in operation. Take control of the health and safety of your family today and switch over to FRESH WATER. Contact us today to discuss the cost effective health benefits by converting to the latest in Australian Made Fresh Water technology. Ultrasonic algae control - Algae gone forever! Algae are a natural component of most aquatic ecosystems and are found in both fresh and marine waters. They range in size from large kelps (metres in length) to those visible only under a microscope. Algae blooms occur when there are high nutrient levels, low flows, low wind and high temperatures. Ultrasonic waves destroy the algae from within. These ultrasounds are inaudible to humans and pose no threat to people, animals or fish. The effectiveness of this technology is amazing and it will destroy nearly all forms of algae, with minimal impact on the aquatic environment. The product range is optimised depending on size and useage, see the different models available below for ornamental ponds, swimming pools, water storage tanks, lakes, cooling tower, irrigation and wastewater installations. Designed for small ornamental (fish) ponds where an efficient mechanism is needed to remove unwanted algae. Range 10 x 10 m.
Designed for water storage containers where algae poses treatment and health problems. Range 50 x 50 m.
Designed for swimming pools. Can be used in conjunction with freshwater pool management systems. Range 50 x 50 m.
Designed for industrial water supplies like Lakes, Drinking water storage or Waste water treatment plants. Range 100 x 100 m.
As above. Designed for industrial applications as in Cooling towers, Water purifying systems, Water storage, Irrigations installations, Aquaculture etc. Range 150 x 150 m.
The PLUS units work on solar panels and low power (15 W). Range 186 x 186 m.